In my last post I wore my Ralph Lauren bathrobe as an open long jacket. 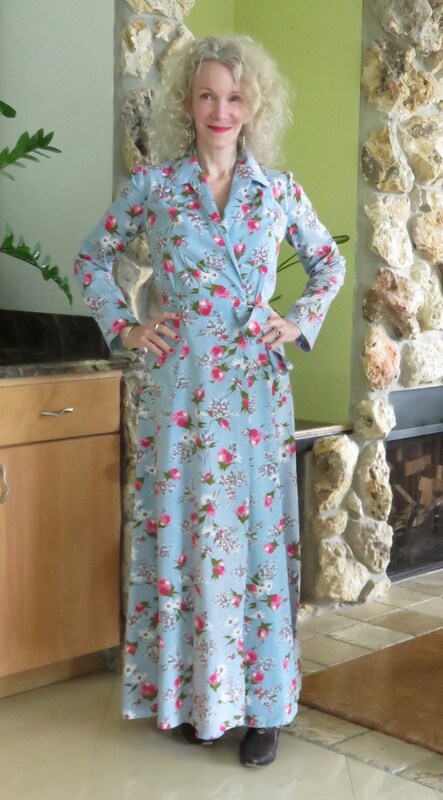 Quite a few people commented that their bathrobes don’t look as glamourous as that Ralph Lauren I scored while thrifting. Here is my every day bathrobe and I wear it more as a dressing gown. It is so soft and warm that my pug Zoë is jealous of it. I won’t be wearing this fuzzy bathrobe out to run errands anytime soon. I thrifted the Ralph Lauren because it was an extra luxurious dressing gown/bathrobe. 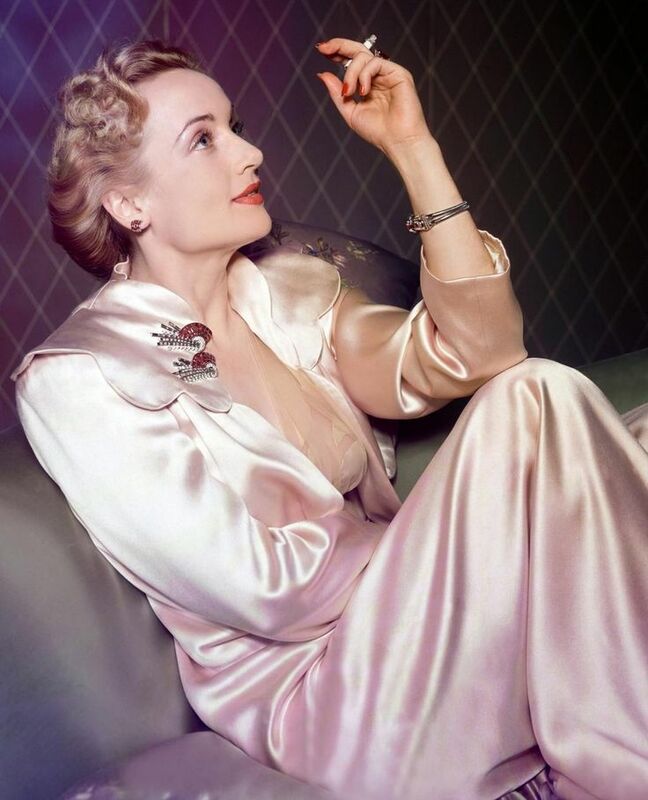 Look at Carole Lombard luxuriating in her dressing gown. Apparently they called them “boudoir robes”. When they’re that fancy it could easily double as red carpet attire. The lovely Patti from Not Dead Yet has also rocked a dressing gown as a dress…although she used a different term calling it a housecoat. I’m far from being the first blogger to exploit this idea. Personally I use the term housecoat/bathrobe/robe and dressing gown interchangeably. Depending on where you’re from, you might have a slightly different interpretation for each of those terms. The reality is that 90% of people don’t even notice what other people are wearing. They are too wrapped up in themselves. Try to remember what you saw people wearing today. Can you remember anything? Did you see someone at the grocery store and think, “Wow! He or she really has it going on!” Or, “He or she looks so interesting!” Or was it just a bunch of ho hum people in outfits that didn’t even register on your radar? There are those that dress to blend in and those that dress to stand out and be remembered. I don’t need to tell you where I fall in that group. To each his or her own. I don’t always dress to stand out. Some days I’ll dress to disappear. Those are normally the lower self esteem days, days when I’m wearing stretch jeans with an elasticized waist, an old graphic tee (often “embellished” in pug hair), runners, an Eddie Bauer hiking jacket and some kind of a hat with sunglasses. I’m in stealth mode. No one sees me and I see no one. 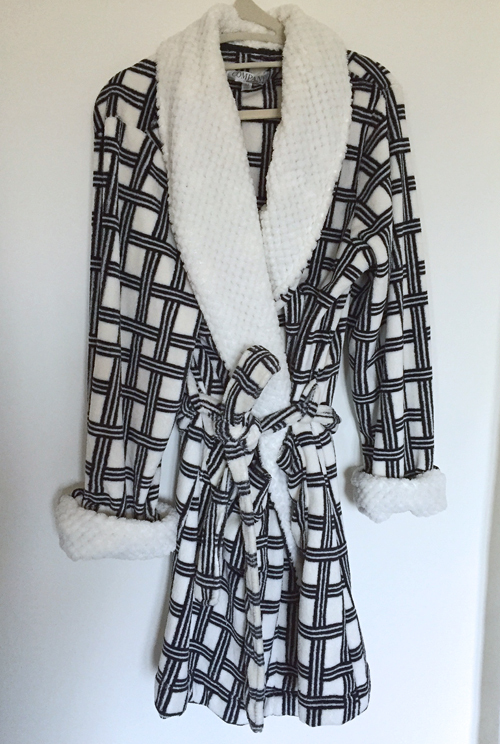 I prefer this version of styling the bathrobe as it suits my body shape more. Belts are a curvy gal’s best friend. What about you? Do you ever dress to disappear? If so, when and why? Melanie and Vix you a both exempt from this question for obvious reasons. Thanks for including little old me in the dress to be looked at gang! I can’t believe you’d ever wear a hideaway outfit, even in the rattiest pair of leggings and dog-hair tee you’d still turn heads with your gorgeousness. You know what? I love the snuggly bath robe. It’s glam and colourful and I’ll fight Zoe for it. Now, that’s more like it! The belt and heels make such a difference, now it looks like a kimono. Very glamorous! 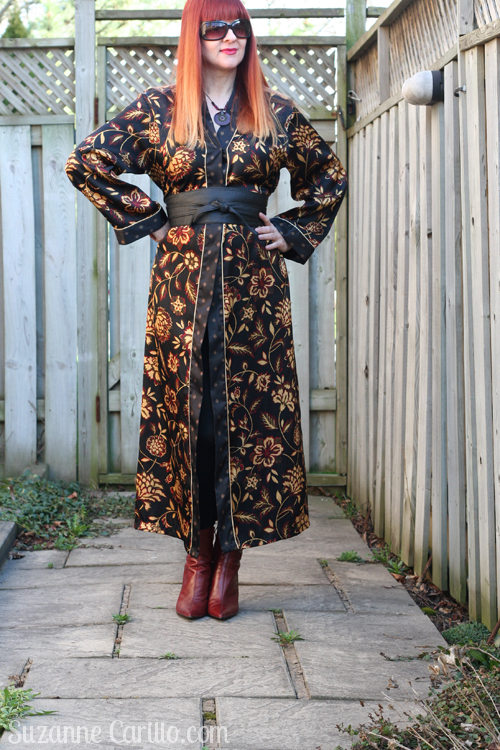 If I saw you on the street wearing your robe as a belted kimono or an open jacket, I would totally remember you because I would be thinking how Beyond Cool you looked and I’d try to imagine what your life must be like because you dress so true, authentically, and artistically. And then I would try to figure out how to be your friend without coming across as creepy with hopes maybe some of the stylish fairy dust that radiates off you might land on me and turn me into a stylish, artistically dressed person. As for dressing to disappear, I do have those days. There are just times when I want to drift through the world unnoticed so I can step back from it and observe it in peace. 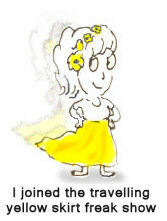 Although I am very social, I am an introvert, needing to recharge in privacy and anonymity. Some days I don’t have the energy to push myself into other people’s awareness. Suzanne you totally rock this look. I love the difference that an obi belt can make. I can’t imagine you in a fade into the background mode, but that’s because we probably are only seeing the extrovert who’s raring to go. You look totally gorgeous in the robe this time. I agree that we can barely remember what others wear, unless you’re a bit too nosy like me. I can pretty well remember everyone’s attire today, but that’s maybe cos I’ve got a smaller circle than most. Invisible? You? Never! That bathrobe is amazing! I even like your indoor robe. I probably stand out when I go out cuz I’m about the only one NOT wearing yoga pants. It’s just a sea of Lycra covered butts out here. 🙂 Who but you could think of something like that?! It looks great and I agree – I wouldn’t even notice it’s a bath robe. lovely outfit (yes, it’s an outfit), and love that subtle oriental vibe you added, it gives a twist! I think that a beautiful print (like this one) can’t be hidden, it was made to go outside and have fun! 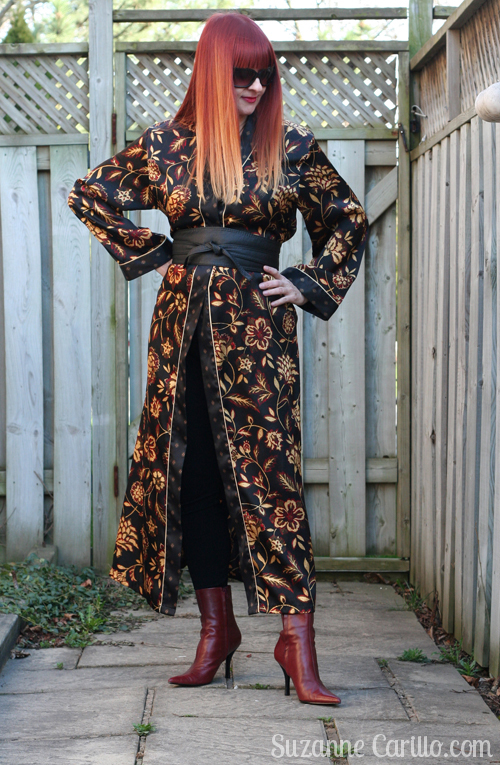 I’m loving your robe-as-a-dress style, but your previous robe-as-a-long-coat was more appealing to me, as it’s more floaty and decadently artistic! I can see why you like the obi with the robe. Gaaa, fantastic styling! BUT, I still like it open with your jeans, simply because I can see it flapping when you walk. It’s highly bad girl, rock ‘n’ roll. You could injure people with that train. Essential. I also can’t imagine you disappearing, no matter how hard you try. People will see your pug hair top and think it’s the latest thing and run out looking for it. heh. nice try. 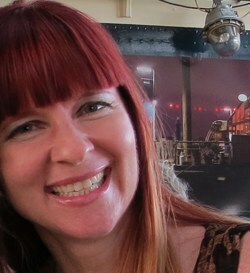 I sometimes dress to disappear too, so my pairing with Vix is undeserved! However, I wear my huge honkin’ sunglasses to cover my face as much as possible, not quite as big as a welder helmet, and it kind of defeats the purpose. Heh. I 100% agree on the ‘nobody else cares what you wear nearly as much as you do.’ And because of that, I wear things that I am very, very happy about! I think your Ralph Lauren ‘bathrobe’ looks fantastic, and very dramatic. Dramatic clothes are good. This does look really good with the belt. I think I tend to notice what people are wearing more than the average joe – because I’m always looking for new ideas and inspiration. Although to be honest, I rarely find it where I live! I’m much better off heading to your blog. Have a wonderful weekend! That is just amazingly fabulous! I love to sew and I collect interesting fabrics to make into kimono type garments–long or short. I wear them with everything. It’s such fun. I’ve never smoked either – Good for us! 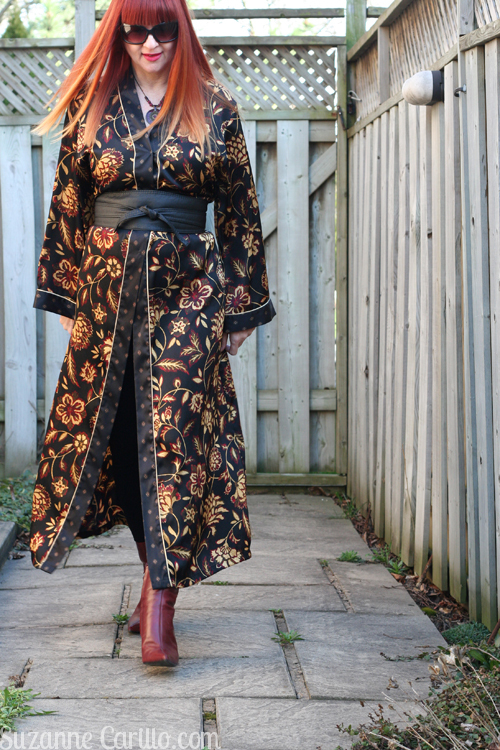 I love Obi belts, so the addition of one to the robe does show off your curves perfectly, but I think it looks great open, maybe for the extra flap-ability and swish-iness? I don’t know that I ever dress to disappear, but when I go to the gym on Sunday mornings it’s jeans and a t-shirt for me, and I don’t make an effort to stand out. The bathroom you showcase is really like a kimono so I can why you can wear it as light outwear. Oh, you look so, so glorious! Terrific solution. Yes this is also a very nice version. Love it. I have this thing for kimonos anyway. As you know. Lovely. Still- it surprises me anyone would have said that about that outfit or this one should “stay home.” Both look like you should be going out. Going out to things like attend indie movies and art galleries, coffee shops and other places it seems like heroines in the movie go to a lot. The obi belt looks really cool here and also manages not to look like cultural appropriation, so- yay! I dress so I won’t be naked. No one wants to see that, I’m sure. Seriously, I LOVE the robe with the obi belt thingy. Ah, the fabulous dramatic flair of this robe. I would so wear a bathrobe as a jacket/dress if if I happened upon one as fabulous as this. It would be criminal to only wear it around the house. I do have my days when I dress to blend in with the locals at Walmart…although I don’t have a mullet and do have all of my teeth so I’m not sure how effective it is. Like you, my “dressing quietly” moments are those times I feel like going stealth. Or if I’m feeling depressed. More often, I let my clothing shout for me. There was that time Ruth and I went to a fashion show and were told to move because we were “too bright” and distracted from the clothing. I think in reality we were “too old” and they wanted 20-somethings in the front. Bah. The obi look is the best. Perseverance rewarded! Oh my gosh…I love it this way too!!! No one rocks a bathrobe quite like you! I know you don’t care what others say about how you dress, right? I mean it’s all in our personal style that makes us who we are, which is creative and unique. 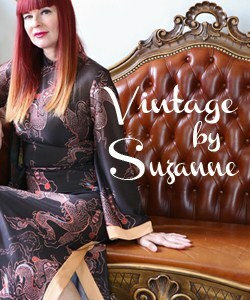 I absolutley adore this beautiful ‘bathrobe’ made into a dress or kaftan, it’s totally you! And those colors are way too great to be used just for the bathroom, what a waste. Ever since our Vancouver meet up and seeing Melanie trapse around the streets in her incredible robes I’ve wanted to do the same, just haven’t spotted one that isn’t frilly. This is perfect!